Not a lot went out this week, although I do owe a shout out and big thank you to jennlk for gifting me the equivalent of one and half kitchen garbage bags worth of yarn. I've already consumed one full skein in creating my most recent cat bed and had to dive back into the stash for a second. I haven't yet decided on the colors to use next, but I know her yarn will go fast once I finish up with the partial skeins that are currently in my project box. 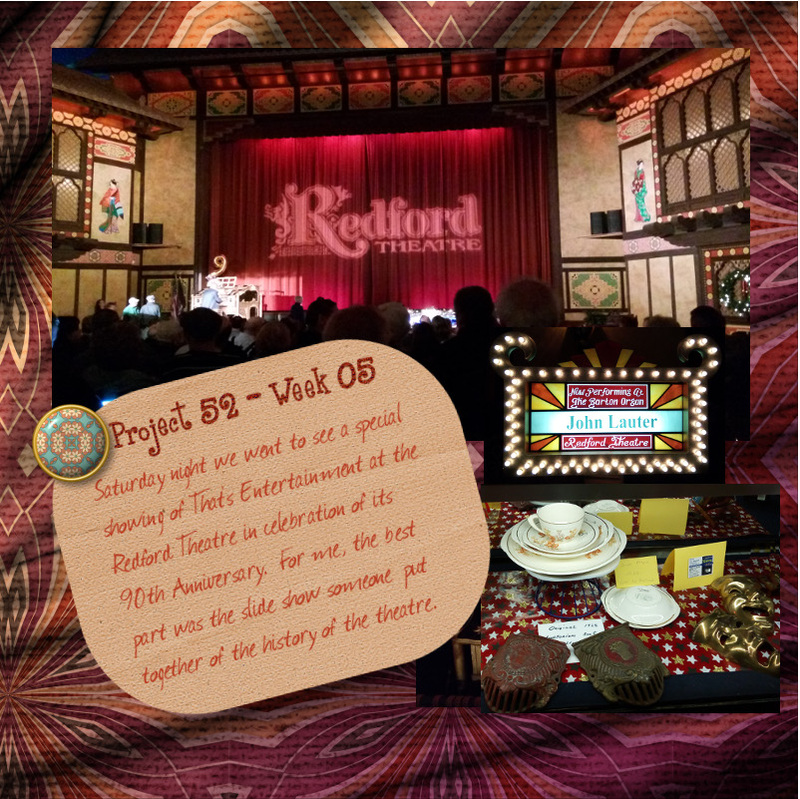 The big event of the week was going to see That's Entertainment at the Redford. I thought I'd seen the movie before but now I wonder if I saw something with a similar name as I didn't recognize anything other than song and dance numbers I'd seen in the original movies. I wasn't sure I wanted to go until jebra reminded me that this was a single showing and was intended to honor the anniversary of the theater's opening ninety years ago that day. For me, the best part was the lecture before the movie, when one of the founding members of the Motor City Theatre Organ Society gave a talk about the history of the theater and how it came to be owned and restored by the MCTOS. (The years had not been kind to the building, nor had its Japanese Garden theme been a boon to ticket sales during World War II. What survived of the original interior was disguised with curtains and unattractive paneling, turning giving it, as the lecturer commented, the feel of a Methodist Church Meeting Hall. If you noticed the photo in the bottom right corner of the Project page and are wondering why I'd photographed a stack of dishes, it's because they were on display in the lobby and because they are relics from the Dish Day ticket promotion during the Great Depression. The dishes on display were gifted back to the theater by the woman who collected them back in the 1930s. I know this because I was so entranced by the dishes (I just love those Art Deco curves on the edges) I went in search of the information booth (table) to ask about them. I also learned that her own grandmother collected a complete set of dishes from her local theater and that in that theater's case, the cost of the dishes was not a set fee plus the cost of a movie ticket, but a movie ticket and a potato (which was then given to another organization to help feed the hungry). You are very welcome. I was doing a deep clean/purge of the stash and realised that I'd never actually use that yarn (some was Mum's that I got when she moved) about the time you mentioned you were looking for yarn. Beautiful dishes! And I love the story behind them.